The Tritons Fountain would have been lost forever had restoration works not started immediately, Infrastructure Minister Joe Mizzi said today. “The fountain was in a lamentable state, and had been left dilapidated. The bronze figures were no longer safe and would have been lost had we not intervened,” he said. Addressing a press conference at the Tritons Fountain site, Mr Mizzi said the damage to the bronze figures had been greater than expected, and the restoration was proving to be more laborious than initially thought. The three figures, which hold up a large plate, are currently being restored in a foundry in Florence, Fonderia Artisica Fernando Marinelli, at a cost of €4million. They are expected to be completed next month, with the entire regeneration of the area outside City Gate earmarked for completion by the end of the year. The City Gate Ditch, the pedestrianisation of the old bus terminus and the area around the RAF memorial known as Il-Biskuttin are all included in the project. We kept finding people who were qualified and capable of restoring the fountain but kept pulling out in the 11th hour when they realised the extent of the damage and the difficulty involved in repairing it. 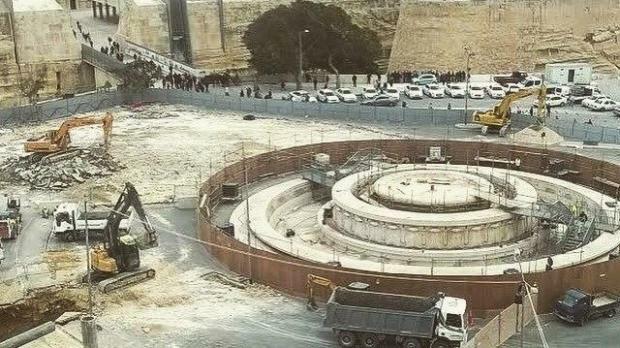 Mr Mizzi said finding a company willing and able to restore the fountain had been the most challenging agreement to reach since he took office. “We kept finding people who were qualified and capable of restoring the fountain but kept pulling out in the 11th hour when they realised the extent of the damage and the difficulty involved in repairing it,” he said. The minister told reporters that the base of the figures, designed by Vincent Apap, had in the past been dipped in concrete. Removing it was resulting in even further cracks, which needed restoration. Plans to restore this iconic landmark at the capital's entrance have been in the pipeline since 2011, but works only started in February, partly due to delays in the tendering process. In 2011 the project, meant to be incorporated in Renzo Piano’s Valletta plan, was budgeted at €2 million. However, at the start of works, it was announced that the cost had doubled. The bronze basin supported by the three Triton figures needed to be recast due to the extensive warping suffered following its collapse in 1978. Mr Mizzi said he was happy to announce that the restoration would be restoring the plate to its original state. The government is also urging the public to come forward with photos or memories of the fountain which will be used in publications and an exhibition when the restoration is completed. Mr Mizzi said the site was a national landmark which was etched into the country’s collective memory. “Everyone knows this site. And for many it carries special memories,” he said. Images can be sent to tritoni@gov.mt, as well as taken to the Transport Ministry until June 30. The work is being carried out in association with the Grand Harbour Regeneration Corporation.